Microsoft Outlook is a desktop based email client that works as personal information manager for users. It offers foolproof emailing, contact management, scheduler, and Notes taker services to users worldwide. Features like graphical user interface, compatibility, and Windows-based operability makes it favorite of all types of users. Microsoft Outlook when used in conjunction with Exchange Server also provides facility to work in offline mode which is an added advantage for users. But, sometimes there occurs a need to read PST files when there is no MS Outlook installed on the system. In such cases, Outlook Data File Viewer comes in help using which users can easily read PST file without Outlook installation. Storage Location of Outlook Messages And Other Elements!! Users can also open PST file from ‘Account Settings’ Windows in Outlook application. The accessibility of PST files is completely dependent on the availability of MS Outlook application. If you have Outlook application installed and configured properly through a POP3/IMAP account with valid or dummy account you can preview all mailbox items. But in absence of Outlook, PST files cannot be accessed using any other application except third-party tools. If you are amongst one of those users who wish to read PST file data without Outlook application, then Outlook Data File Viewer is the best solution for you. PST File Viewer is a standalone tool that does not require any pre-installments to preview multiple PST files data. 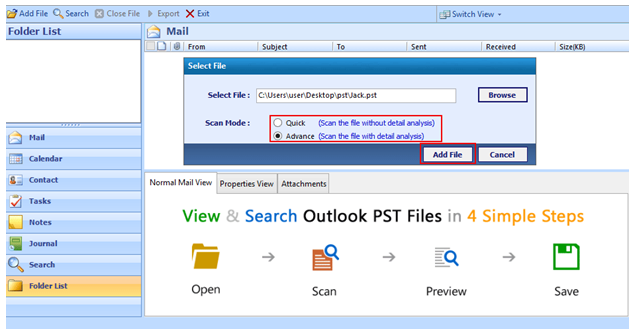 Without having Outlook application installed in system users can preview complete PST file items including emails, contacts, calendars, journals and to do lists detail wise. After downloading and installing Outlook data file viewer tool in the system, launch it from system to begin the process of opening Outlook data file data. Choose scanning options i.e. Quick or Advance as per requirements and proceed to next step. Advance scanning mode is helpful in the preview of severely corrupt PST file data. After completing scanning process, the tool provides a preview of PST file mailbox items in software panel. 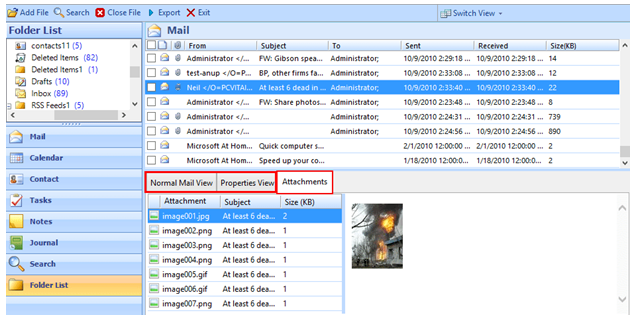 Embedded email attachments and email properties view can be taken to analyze technical details of Outlook data file. The tool is completely easy to use and reliable to view PST file without Outlook. For forensics investigation and detailed study about Outlook data file items, users can undoubtedly install the tool in the system. The PST file viewer tool does not hamper or delete any original information of PST file during scanning and preview process which is an added advantage for users. The non-compulsion of Outlook application makes Outlook data file viewer tool choice of millions of users.